GRF Davos signed a Framework Agreement of Cooperation with the Qianhai/Shenzhen Authorities and the Beijing Normal University at the jointly organised International Symposium on Integrated Governance of Large-scale Disaster and Economic Risks. The Global Risk Forum is an independent non-profit organisation performing applied research in the field of integrative risk management. GRF Davos implements research and development projects in the sense of an integrative risk management approach. We are your experts in the field of risk analysis and assessment, natural hazards, geology, climate change critical infrstructures, disaster management and prevention. GRF Davos is host of a series of international conferences, offers training courses and workshops in the field of disaster and risk management. GRF Davos specialises in the full-service management of conferences and events with anything from 20 - 1000 delegates, across a broad spectrum of areas; from scientific to government and education. Our aim is to make your job easy, and our experience team are practiced in finding solutions to any challenge in order to create extraordinary events for you and your clients. From the concept and agenda setting, to marketing, logistics and on-site conference management as a full-service organisation, we can manage every aspect of your conference or event from beginning to end. The Global Risk Forum GRF Davos promotes the worldwide exchange of knowledge and expertise, creates solutions and fosters good practices in integrative risk and disaster management and climate change adaptation. We create interaction between key players by connecting line ministries, disaster, risk and safety management authorities, academic institutions, practitioners, the private sector, and the press. We strongly believe that by sharing our knowledge and experience we can contribute to a more sustainable, safer planet. The 1-day IDRC Davos 2018 Conference on Risk, Resilience and Disaster Management with international top experts in risk and disaster management was successfully held on 23 November 2018 in Davos, Switzerland. The symposium provided first-hand information on the Sulawesi Earthquake and Tsunami which hit Indonesia on the 29 September 2018, and provided many new insights into the macro-economic analysis of risk reduction measures, into the status of sustainability and resilience of our built environment and the needs for research and education, the need for a paradigm shift in handling hybrid threats, and the role of the media in in times of disasters. A Panel Discussion outlined the needs in science, education, training and public awareness rising for a risk and resilience based disaster risk management. 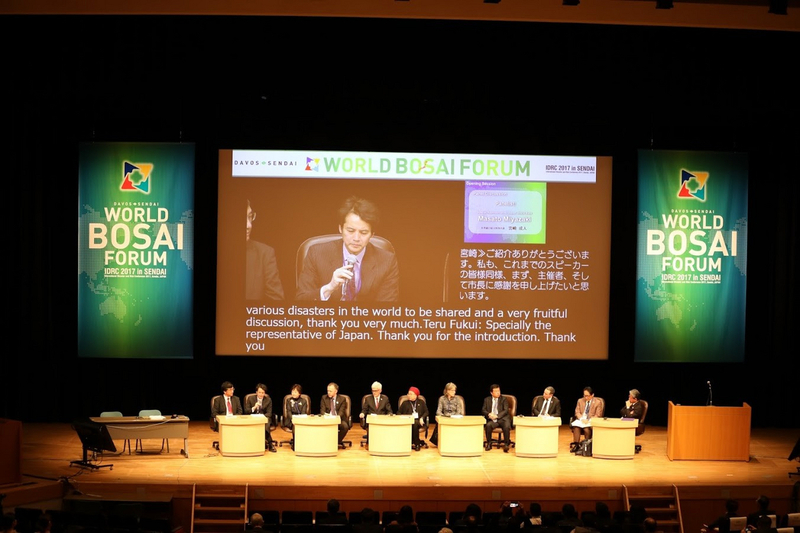 A highlight was also the launching of the 2nd World Bosai Forum/IDRC Sendai 2019, which will take place No. 9 – 12, 2019 in Sendai/ Japan. The official Sendai Framework for Disaster Risk Reduction 2015-2030 publication has been released on 1 Juy 2015. The Sendai Framework for Disaster Risk Reduction 2015-2030 was adopted by UN Member States on 18 March 2015 at the Third UN World Conference on Disaster Risk Reduction in Sendai City, Miyagi Prefecture, Japan. The Sendai Framework is the first major agreement of the post-2015 development agenda, with seven targets and four priorities for action.